A strong bond of friendship, loyalty, and love exists between the Police Officer and the Police Dog. In time of need, to protect the officer, a Police Dog will not consider the extent of injury he will receive or if he will survive through to see the success. He follows the command of his Handler without his own judgement. Nothing lives forever, not even the brave, but these Police Dogs with their normal behavior leave a mark of distinction behind them. Compromise on bravery and morals is not part of their training. Often we have seen tears in the eyes of the Police Officer when his Dog is hurt, so strong is the bond between them. in many jurisdictions. Most of these trained dogs wear ballistic vests, are sworn officers, with their own Police badges and ID’s. Beagles are used in airports as detection dogs or explosive sniffing dogs. These dogs detect illicit substances such as drugs and explosives, and sniff the baggage for items that are not permitted. German Shepherds are attack dogs. They protect the officer and do ground based tracking as well as air based tracking. They find human remains, drugs, IED’s, and are trained to find evidence. Labrador Retrievers sniff out bombs and drugs. Bernese Mountain Dogs find missing people. Argentine Dogo‘s sniff out bombs, drugs, and food. Belgian Malinois are trained to find IED’s, find evidence, drugs, prisoner transport, and human tracking. 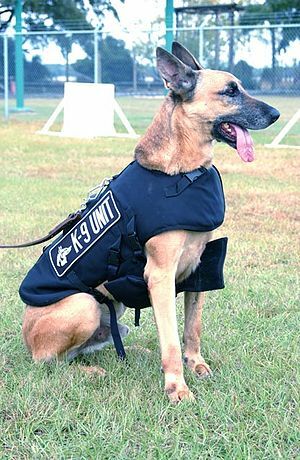 Dutch Shepherd, Boxer, Doberman Pinscher, Rottweiler, Giant Schnauzer are trained as attack dogs who also protect the Police Officer. Police Dogs are retired if they become injured to an extent where they will not recover completely, are pregnant, are raising puppies, or are too old to continue to work. does not know who is the target and who is the terrorist. They work deep underground where crime can unfold in a heartbeat. Millions of people pass through transit. The labyrinth of concrete and steel can prove to be a hostile underworld. The serious issues are the stairs, slippery floors, loud noise of the trains, and massive amount of people who pass through the subway. These dogs are trained to filter out the other distractions of their extreme environment, and stay on point. If a call comes in that a robbery is in progress, the Police Officer and his dog are the first to respond. A German Shepherd can bite down with 240 lbs of pressure. With training their grip and confidence increases. Police Dogs need to have a lot of confidence and the Police Officer in charge does everything to boast up that confidence. The Officers make sure that the dogs believe that they will win in the adverse situation. In every training exercise the confidence of the Dog is built up. The worst dilemma of a Police Officer is to know that he can put the dog in a situation where he can be killed. For all Police Officers it is the hardest thing to do. Police dogs are the vital tools for the Police department and the Police Officers know that no matter how much they love their dogs, and train with them every single day, but their main job is to get the criminal. These Police Dogs can take down armed men without any hesitation and hence can lose their life in a moment. They are never afraid so they are always brave. Owing to their training, these Police Dogs never fail in their purpose and duty. If the Police Dogs are killed in the line of duty they get the same honors as their human partners. Their handlers make all the decisions about their most loyal and loved partners. This entry was posted in Uncategorized and tagged American Staffordshire Terrier, Doberman Pinscher, Dutch Shepherd, Giant Schnauzer, Police, police dog, Police officer, Rottweiler. Bookmark the permalink. Most people don’t realize the major role the K-9 unit plays in law enforcement. Thanks for bringing this to our attention. Great post! Thanks for reblogging. Have a wonderful day. Thank you so much for camping at my blog. Delighted to hear that you enjoyed your visit. Looking forward to many many more visits, the campground is reserved for you the year round. I spent sometime on your blog and I have found it enriching and truthful. I would be going through the areas I could not browse on this visit. Well thanks for everything and take care. Yes I can understand. These dogs are so amazing, and the human connection with them is fascinating. Thanks for the visit. Please come again. I love your blog and specially your poetry. Britney I went to the help and support section of the WordPress and they do not recommend any additional plugin for a WordPress. Com site. If you need more help go into the support section of WordPress and they will answer any question and also you may find answer in the topics they have provided. I hope this is helpful ? They also have a step by step set up of your site which I followed to set up mine. As I begin to explore your blog, I am impressed by your presentation of the topic. You’ve conveyed not only information about the Police Dog’s training and working conditions we humans would find most challenging if put in the same spot, but you’ve also given us a sense of the heartbeat of a trained and always dedicated Police Dog. They truly are amazing animals. I learned a lot from your post. I did not know that Labrador Retrievers sniff out drugs and bombs. (We had a black lab.) Thanks for stopping by my blog and for the follow. Up as a Nominee for Best blog post. And Finally a nice incite to the Police world. Thanks for the reblog and appreciation of my post. I feel honored that you have recommended it as a Nominee for the Best blog post. Thanks once again.